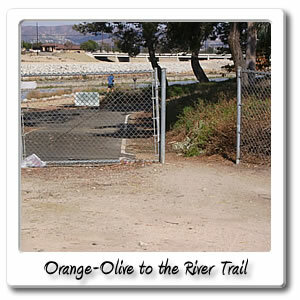 Welcome to Orange Olive Road on the Santa Ana River bicycle trail. 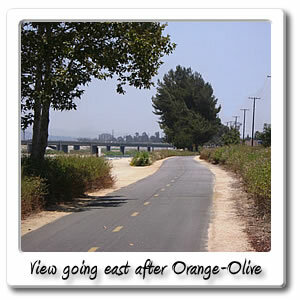 Just after mile marker 17, will be the Orange-Olive Road entry point which is 17.1 miles, 1 hour 26 mins, from the beach on the Santa Ana River Trail. 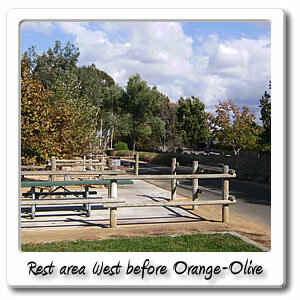 You will also be 1 hour and 11.7 miles to the end of the Orange County section of the Santa Ana River Trail. 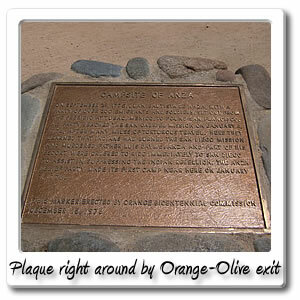 You will want to get off at this exit if you want to go to the Village of Orange, as opposed to getting off at Tustin Avenue, as there is a large hill to climb. 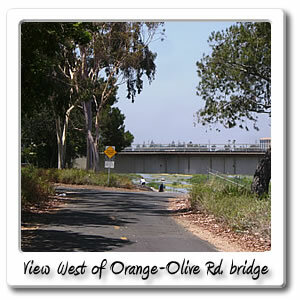 The only way to go is south on Orange-Olive Road in the City of Orange. Going south for 3 minutes and going for .7 miles will take you to Lincoln Avenue, in the City of Orange, you will find a liquor store, and a few shops. 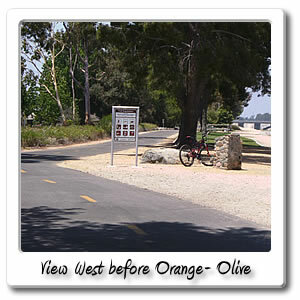 If you continue south on Orange-Olive Road for .4m miles for a couple of minutes, you will come up to Heim Avenue, which starts on the left side of you, and you can take Heim Avenue in the City of Orange for a few minutes and go .5 miles east then you can get into the back of the Village of Orange after turning right and going south on Canal street for less than a 1000 feet, then you can make a left, and go through the back parking lot, to find the front of the Village of Orange. 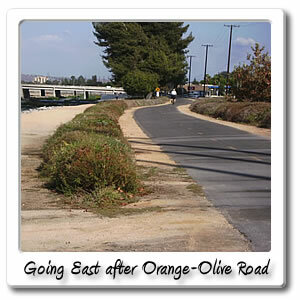 The one way trip will take 1.7 miles and 9 minutes. 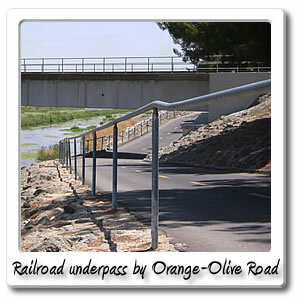 You can find a 7-11 back off of the Glassell exit on the Santa Ana River Trail which is .7 miles and 4 minutes west. 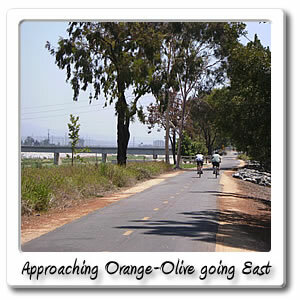 The next entry point is Gayle Street and Riverdale Avenue, in the City of Orange which is east .2 miles and 56 seconds on the Santa Ana River Trail.